In trying to describe a natural force outside the bounds of human comprehension, one poet managed to inspire generations. Niágara: a Pan-American Story by Propeller Arts Projects with PANAMANIA, playing at the Ada Slaight Hall is a love-story, a history lesson, and a meditation on nature and poetry that is gorgeous, moving, and memorable. Revolutionary Cuban poet José María Heredia (René Millán), while exiled from his country in 1824, wrote the famous poem Ode to Niágara/El Cantor del Niágara after witnessing the immensity of Niagara Falls. His wife Merced (Paula Rivera), tells the story of his exile, his journey to Niagara, and what happens after. I don’t even know where to start because quite frankly, Niágara is fantastic. The actors are perfect, the projection design is jaw-dropping, and the sound design is beautiful. Let’s start with the actors: Rivera and Millán are great together. Here are two actors who have great chemistry. Millán, as Heredia, was incredibly charming. He was arrogant, passionate, articulate, and, at times, frustratingly stubborn. Millán didn’t just bring Heredia to life, he also gave the audience an access point. Without any context for Heredia’s work, I left the theatre inspired to read more about him. In contrast, Rivera was given the difficult task of portraying three distinct characters with little more than a costume change. It was my guest who pointed out her incredible character work. Each woman–Merceda, Isabel, and Jacoba—is clearly defined in body language, tone of voice, and even in their energy. Isabel was hot-headed and quick to anger, Jacoba was refined, and Merceda was melancholy. You couldn’t mistake one for the other even as Rivera embodied all three. Director Veronica Tennant gave her actors the room to do their work, letting them move about the space and capitalizing on wordless interactions that communicated as much as more vocal exchanges. If there’s a weakness in Tennant’s vision, it’s her attempt to flesh out every piece of Heredia’s life when it’s not needed. Early in the play, Tennant attempts to show time passing and young love growing through a small scene of wordless interaction between Heredia and childhood friend Isabella. While I thought the intent behind the scene was clever, it slowed the pace noticeably when compared to other, shorter, snippets that were just as effective but not quite so drawn out. But that was a small complaint that was easily lost against such wonderful, projected backdrops that drew the eye in some of the slower moments. The projections by Cameron Davis were everything I have ever wanted in theatre. I could describe the use of colours to depict the Mexican sky, or the shadow figures that dance on the screens, larger than life, but none of it compared to the ending which, unfortunately, I can’t give away. And underneath everything were the incredible vocals of Brent Carver combined with the composition and sound design of John Gzowski. Nothing overcame the performers onstage. Instead, the music added weight to wordless vignettes between the characters. One scene involving a dance between Merceda and Heredia near the end springs to mind where the music told as much of the story as the performers. 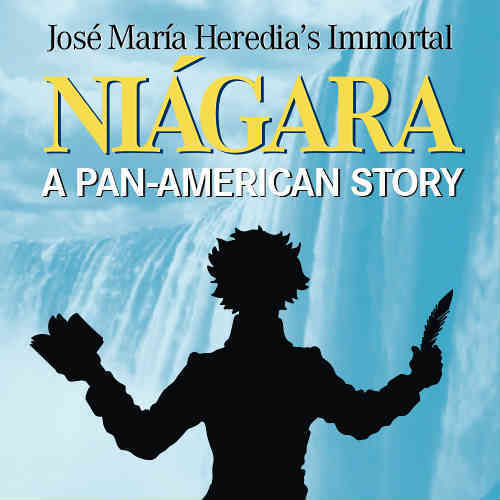 Much like Niagara Falls itself, Niágara: a Pan-American Story is truly awesome. This is a show that demands to be seen and I would never deny it.